Have You Seen a Chainsaw-Carved Bear? Imagine taking a 12-foot cypress stump and using a chainsaw to create an incredible piece of art. 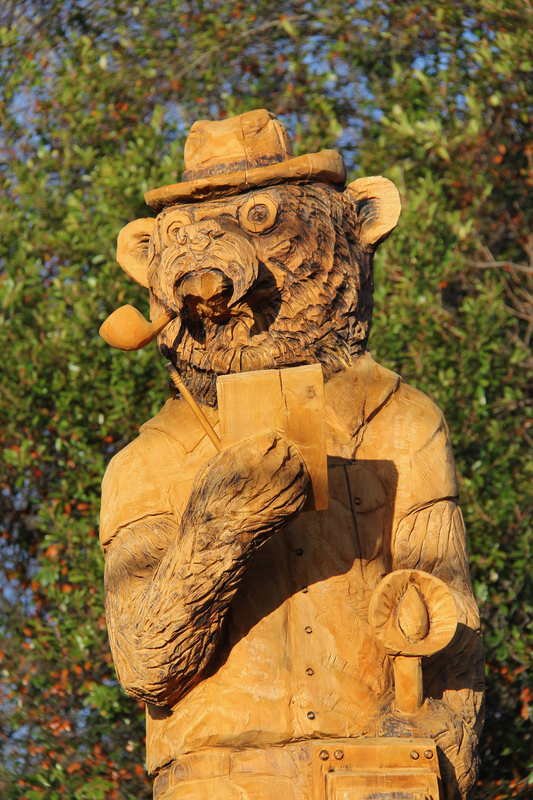 The chainsaw artistry of Dayton Scoggins and his business, Artistry in Wood is visible throughout the city of Rolling Fork as evidence of past Great Delta Bear Affair festivals, and each year a new bear sculpture is added to the count. It has become a custom for the Rolling Fork community to gain a new chainsaw carved bear each year during the Great Delta Bear Affair, and some years, two. There is always great anticipation in the community to see what the new bear will look like and where it will be placed post-festival. The bears have been such a hit that a couple of private businesses and individuals have sponsored their own sculptures in addition to the festival carving each year. Each carved bear has its own personality, Doctor Bear in front of the Sharkey Issaquena Community Hospital with his stethoscope and chart, Lineman Bear climbing a power pole in front of Twin County EPA, Presidential Bear in front of the Sharkey County Courthouse, Library Bear reading and sitting on a stack of books by the Sharkey Issaquena County Library and there are, to date, 11 more in town! Two carvings are not bears, but rather depict President Theodore Roosevelt and his hunting guide, Holt Collier who are placed together near the Rolling Fork branch of the Bank of Anguilla. The bears that are on public property are landscaped and maintained by the Rolling Fork Garden Club. Watching Dayton carve has become a popular activity during the festival. He begins carving on Friday during Youth Education Day and finishes the sculpture during the festival on Saturday. Come out and watch Dayton Scoggins and Artistry in Wood create magnificent art during the Great Delta Bear Affair on Saturday, October 27, and come tour the bears of Rolling Fork anytime. We can “BEARLY” wait to see you!